The Museo Thyssen-Bornemisza, with the generous collaboration of the Munch Museum in Oslo, presents the first exhibition devoted to the Norwegian artist held in Madrid since 1984. 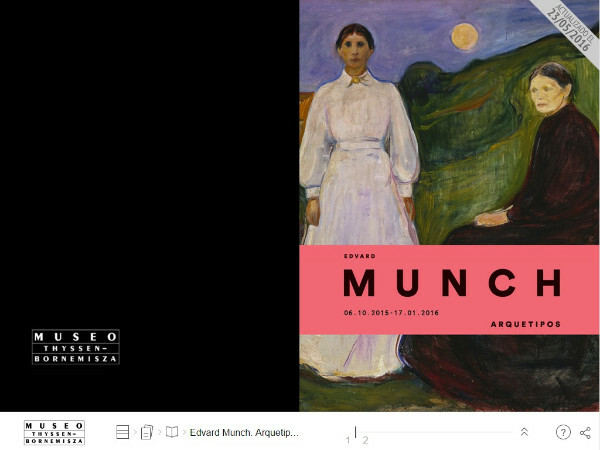 Curated by Paloma Alarcó, Chief Curator of Modern Painting at the Museo Thyssen-Bornemisza, and Jon-Ove Steihaug, Director of Collections and Exhibitions at the Munch Museum,Edvard Munch: Archetypes explores the painter’s contributions to the history of modern art, accomplishments that make him—along with Paul Cézanne, Paul Gauguin, and Vincent van Gogh—one of its founding figures. The exhibition brings together an extensive catalogue of contemporary humankind’s emotional archetypes and existential obsessions, ranging from love and desire, to jealousy, melancholy, and angst, to illness and death. The nine sections into which it has been subdivided are structured around the representation of the human form in difference scenarios, including the seaside, the sickroom, the abyss, the green room, the forest, the night, and the artist’s studio. In each of these sections, early works are combined with later versions, both paintings and prints, in order to emphasize the thematic circularity of Munch’s output. The radicalness of his pictorial language is revealed in the play of flat and sinuous forms, in the expressive deformation of the human body, in the symbolism of colour, and in his use of experimental textures and techniques in printmaking, with which Munch explored the relationships between external signs of the physical world and the hidden spiritual dimension of reality. Munch’s long and prolific career, which lasted until his death in 1944, is represented by eighty works; half of these are from the Munch Museum itself, while the others come from European and American collections such as the Nasjonalmuseum in Oslo, the Tate, the Städel Museum in Frankfurt, the Kunsthaus in Zürich, and MoMA in New York.